Posted on August 11, 2011 by Greg C.
LinkedIn made changes to start using your picture in advertising on their network. Â After getting inundated with negative feedback LinkedIn announced they were going to turn off this feature. 1. Click on your name on your LinkedIn homepage (upper right corner). On the drop-down menu, select â€œSettingsâ€. 2. From the â€œSettingsâ€ page, select â€œAccountâ€. 3. In the column next to â€œAccountâ€, click â€œManage Social Advertisingâ€. 4. De-select the box next to â€œLinkedIn may use my name, photo in social advertisingâ€. This was an interesting move by LinkedIn. Â I treat my LinkedIn profile seriously because it is a view of my professional life. Â I have my CV on there, as well as using it for keeping track of business contacts. Â LinkedIn is not for friends, it is for my professional life. Â I donâ€™t want potential partners or customers seeing that I endorse something that I donâ€™t approve of. I am glad LinkedIn acted quickly today to remove this functionality, but the bait and switch of privacy among social networks is tricky. Â I dealt with this a bunch when I worked on AIM, and for the most part aired on the side of caution, but we definitely had our own versions of this happen to us. Posted on August 10, 2011 by Greg C.
For those that follow the blog know I work at Clearspring and I am in charge of AddThis which is the largest sharing platform on the Internet. Â Our product enables over 9 million web sites all over the world to get their content shared to hundreds of services from Facebook to Google+ and Twitter. Â Our sharing tool supports 70 different languages and is used by over 1 billion users per month. The team that works on AddThis works hard but also plays hard. Â We race cars, drink scotch, play withÂ terabytesÂ of data, get free lunch and snacks, and most importantly build products that users and publishers love. We are looking to grow the team with really smart andÂ energeticÂ people. Â We have a bunch of different openings, everything from a Senior Java Engineer to a Senior Biz Dev role. Â If you are interested in a job or know someone who is, let me know by emailing me at greg-at-clearspring-dot-com. Starbucks has said for years that it offers over 87,000 drink menu combinations, but just recently a new secret menu has been revealed by loyal Starbucks customers. Â There are some famous other secret menus, the best being In-n-Out’s Super Secret Menu. 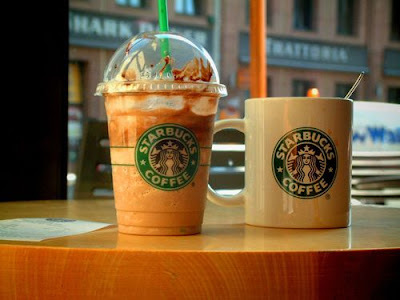 I definitely need to check out some of these awesome new drinks at Starbucks. Biscotti Frapuccino: Buy a biscotti and ask the barista to blend it up with any flavor of frapuccino. It blends into tiny cookie chunks that add a delicious little crunch to your frozen coffee. Short Drink: The sizes the â€œmainstream menuâ€ gives you are â€œTall,â€ â€œGrandeâ€ and â€œVenti,â€ but if you say you want the â€œshortâ€ size to any Starbucks drink you can receive a less expensive and smaller sized drink. Although this size is in their cash register, they donâ€™t put it on the menu as a marketing strategy to make customers buy larger and more expensive drinks. Short cappuccino: A â€œShortâ€ cappuccino is a more Italian style cappuccino. Basically this cappuccino leaves out the gallons of milk Starbucks puts in for the more traditional amount of dairy that the drink originated with. Red Eye: A shot of espresso in regular drip coffee. Black Eye: Two shots of espresso in regular drip coffee. Green Eye: Three shots of espresso in regular drip coffee. Not for anyone with a heart condition or road rage issues. Poor Manâ€™s Latte: Order an Iced Americano with no water and half ice, then you can add free half and half at the little milk and condiments table. This is the same drink as a Breve Latte but costs much less. Just watch out for the classy police. This is definitely not the most chic thing to be caught doing by your mother-in-law or boss. Poor Manâ€™s Chai Latte: Order a Chai Tea Misto with extra foam, two tea bags, and half cinnamon-half vanilla syrup. This is basically the same drink but almost half the price. Cafe au Lait: If your French and looking for something nostalgic of your homeland order the Misto without foam for a classic French coffee drink. French pressed coffee: You can choose any coffee they sell by the bag and have it served in a French press. For coffee snobs, this is one of the best way to appreciate all of the flavors of the coffee you chose. Chocolate Cream Frapuccino: Chocolate syrup and chocolate flavoring. Lots and Lots of chocolate! Do not underestimate the amount of chocolate in this frozen blended coffee. Only for the true chocolate loverÂ die hard. Cake Batter Frappuccino: Perhaps a little deceptively named, as there are no actual piece of cake or cake batter in it, this beverage adds vanilla and almond syrup to a Vanilla Frappuccino. Captain Crunch Frappuccino: Fans say that the combination of hazelnut syrup (though some folks contend it should be toffee nut) in aÂ Strawberries and Creme Frappuccino is a dead ringer for the flavor of Captain Crunch cereal. Now I must warn you, The Washington City Paper tried ordering some of these secret items and had varying success. Â In the end if you can describe what’s in the drink then the drink you shall have. Â Starbucks gets an A+ for customer service. Posted on July 29, 2011 by Greg C.
I made a bet back in April that the government was not going to be able to avoid a down grade in the rating of the US debt. Â The bet was to move money out of the market onto the sidelines. Â I went from 90% of capital in the market to 35% of my money in the stock market. Â I left my holdings in Apple and Amazon and few low risk mutual funds. My bet was slow to start working in my favor, but I just don’t see how the debt crisis gets resolved. Â I think the best we do is get temporary relief for a few months before we relive the debate again. Â I hate thinking the worst of our politicians but it was obvious early in the spring there was no way we could reach compromise on a grand scale. Â Living in Washington my whole life I have never seen the government as divided as it has been over the past 10 years. Once we get past Tuesday, then it will be time to take stock (pun intended) and decide if and when to get back into the market. Â Hopefully our elected leaders sober up and realize what happens when we default. Posted on July 27, 2011 by Greg C.
I still get tons of laughs from the last 13 years of Washington Redskin history. Â As someone who never missed a home game growing up, I have only been to 2 games at FedEx field. Â Of all the hilarious coaching mistakes, many fans overlook the Steve Spurrier era preferring to focus on the Jim Zorn era. Â Well Ross Tucker who was an offensive lineman during the Spurrier tenure reminds us on the absurdity of his time as Redskins head coach. This interview along with the Dan Snyder moments, the Redskins are the laughing stock of the NFL. Posted on July 24, 2011 by Greg C.
Like a gambler convinced he has an edge, Atlantic City thought it had an edge in being a gambling destination when New Jersey’s attempt to revitalize the city by legalizing gambling in 1976. Â Atlantic City’s heyday was in the 1920s when prohibition was in place, the city served as an escape where visitors could drink and gambled. Â HBO’s Boardwalk Empire tells the tale of Atlantic City during this period. With this in mind, I headed to Atlantic City for one night. Â Sadly, Atlantic City’s best days are behind it. Â With more states legalizing gambling the excitement of heading to AC as an alternative to Vegas is waning. Â Just to get to the main strip with Caesars, Bally’s and Taj Mahal, you have to drive through some of the most depressing neighborhoods. Â Its a fond reminder of what happens if you gamble to often. Â We went to the Shops at Pier in Caesars which were nice, but no one will confuse it with The Forum Shops in Vegas. For dinner we went to Borgata, and it was here I felt like we were in a Vegas-style hotel. Â But what does it say about Atlantic City if we had to leave the Boardwalk to get a pleasant experience. For Atlantic City to deliver it needs something toÂ differentiateÂ itself. Â How about legalizing sports gambling? Â Perhaps they should just concentrate on moving the casinos to closer to the Borgata. Â Atlantic City needs to bet big to get me to return. Posted on July 21, 2011 by Greg C.
Google+ has been out for 3 weeks now, and what has started out as an Emerald Sea has turned into a tidal wave of excitement and opinions. Â The first night Google+ opened up invites, I posted to Twitter, Facebook, and to everyone at Clearspring that I had invites, and after 2 hours had handed out over 100 invites. Â I had never seen anything like that, including when GMail launched. Â The fervor has not died down either, as many of our publishers have asked us what we think about +1 and Google+. Â Publishers who were so skeptical of +1 and were taking a wait and see approach are now are clamoring for the button. Â As a launch partner for +1, adoption was steady at first but now we see “hockey stick” growth in installs and clicks. I have been telling publishers that Google+ is off to a promising start. Â I think they definitely got their video chat product, “Hangouts” right, and I will cover that in a future blog post. Â Circles is great and the overall look and feel is awesome. Â Early adopters are loving it because it is a bright shinny object, and because “it is not Facebook.” Â However, it is still early and the jury is still out if mainstream users will start using Google+. Â Publishers are intrigued because of the influence +1 has on search results, but it is still early here as well to know if the impact will matter. Not that I can see in the near or mid term. Â Nothing lasts forever in the online world of social, but Facebook is not going anywhere yet. Â From what I can see, the online behavior that has changed for me the most is not my engagement with Facebook, but rather my engagement with Twitter. Â I have posted less to Twitter and more to Google+, I still consume my Twitter feed via Tweetdeck, but I am more engaged with the people I follow on Google+. Â The nice thing about Google+ was that it was like starting anew, where I had a clean slate of people I could choose to follow and friend. Posted on July 18, 2011 by Greg C.
Dating back to the dawn of man we have been obsessed about getting from point A to point B the fastest way possible. Â As we developed various modes of transportation the obsession became a debate as to which vehicle could move us faster and which route to take. From “Around the World in 80 Days” by Jules Verne to Top Gear’s 5th episode in the 10th season, we have been racing planes, balloons, boats, and bicycles to see which moves us faster from point A to point B. Â With that in mind we now have an answer in the debate of whether a bike can beat an airplane from Burbank to Long Beach in LA. Thanks to Carmagedon, JetBlue flew a few planes 20 minutes between Burbank and Long Beach to help people avoid the 405 expressway’s 10 mile long closures. Â This inspired a bunch of bikers to challenge the airplane to a race. Â A passenger on the plane and the bikers left the same location in Burbank at the same time, and the first to get to the Long Beach Aquarium wins. Â Because the flyer has to check in, go through security and board, the cyclists made it to Long Beach before the plane even took off. Posted on July 13, 2011 by Greg C.
Many US Internet users have never heard of a company called Spotify, but tomorrow morning that is going to change. Â Spotify launching in the US is significant as it will trigger a change in the way we consume our music. Â Some of us here in the US have had access to Spotify via a variety of tricks and knowing the right people. I have used Spotify for the last 6 months and the thing I love the most about it is the simple integration of Facebook so I can discover music my friends are listening to. Â This is something Apple has never gotten right with iTunes. Â In iTunes I get to see what the most popular music is across the US, but I have no idea what my friends are listening to. Spotify fixes this problem by letting you create playlists that you share with friends, and the entire Spotify network. Â Being able to mix your local music with streamed music creates an endless library of tunes. Â Rumors of giving Spotify a free 20 hours per month of music is generous despite the ads. Â I have paid for my Spotify account from day one so I can get music on my iPhone/iPad too. Welcome to America Spotify, our ears thank you! Posted on July 12, 2011 by Greg C.
My guess is that Netflix has pressure on multiple fronts. Â First, the costs of mailing DVDs has to be increasing. Â The USPS has been saying for a while that stopping Saturday is on the table unless they raise rates. Â Netflix also has been saying the future is streaming, that DVD shipments may go down this quarter for the first time ever. My issue with Netflix, and let it be known I have a streaming account, is that the content available on Netflix is weak. Â Recently I have thought Amazon has offered better content. Everyone will be watching subscriber numbers closely I am sure over the next two quarters and the stock will be put under the microscope but for me I will be watching to see if Netflix can offer more content.